I am very honoured and humbled by this appointment and grateful for the opportunity to serve the Church in Parramatta during this time. As guided by my motto “go further into the deep” (Lk 5:40), I have taken many leaps of faith before, including the one that launched me literally onto the Pacific Ocean. Now I am about to be cast into the deep interior of Western Sydney, all the way to the beautiful Blue Mountains and the fertile plains of the Hawkesbury River. I cannot help but feel daunted by what lies ahead. Nevertheless, I make bold to move forward, trusting in the sustaining power of God and the support of many people and fellow ministers of the Gospel. 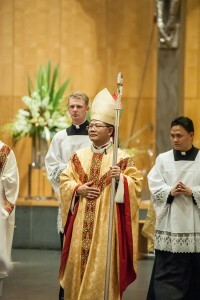 Bishop Vincent Long Van Nguyen OFM Conv. There is an African adage that says “you sit on the old mat to weave the new one”. Already one finds here a richly textured tapestry of a young, vibrant and diverse diocese. So I will sit on an old mat that others have woven, perhaps with a bit more comfort than I would on this generous Cathedra. I am indebted to my predecessors and others who, like the wise master builders Paul talks about in the second reading, have laid a solid foundation (1 Corinthians 10). I honour this legacy and want to build on it. Although I can only walk in my own shoes, I would like to be like the steward who brings out of his storeroom treasures both old and new (Matt 13:52). It is together as bishop, clergy and people that we will listen to what the Spirit is saying to us in our context(Rev 2:28) and discern how to live and witness as disciples of Christ. To say that we are at a critical juncture is probably an understatement. What we are witnessing as the people of faith is the flood of secularisation that has washed away much of the Church we’ve known and loved. We have been battered and bruised. We’ve been reduced in numbers and status. What is more, we have to admit with the greatest humility that we have not lived up to that fundamental ethos of justice, mercy and care for those who have been hurt by our own actions and inactions. And so in the eyes of many, whatever aura of respectability we’ve got left has evaporated with the sexual abuse crisis. The Royal Commission has been a lightning rod, an uncomfortable spotlight, but hopefully a catalyst for transformation. Bishop Long receives formal recognition from two local pilgrims who will participate in World Youth Day 2016. I’d like to think of this critical juncture as analogous to the biblical exile to which as a former refugee I have a personal affinity. The exile was about facing the death of the old and giving birth to the new. The biggest lesson they learned was seeking God’s justice for the poor and the lowly. They learned to be a society in which the care of the most marginalised was to be the essential distinguishing feature. As your new bishop, I’d like to think of my role as that of the prophets who accompany their people in the exile, point to them the signs of the new Kairos and lead them in the direction of the kingdom. I am committed to the renewal of the church patterned on the paschal rhythm of Christ: the church that dies to worldly power, privilege, clericalism and rises to humility, simplicity, equality and servanthood; the church that might be smaller, poorer and humbler but hopefully more of a light and a sacrament of God’s love to the world. The Scriptures we have heard tonight speak of a radical vision of love, inclusion and human flourishing. That vision is enshrined in the prophecy of Isaiah. God’s people, he proclaims, include foreigners who join themselves to the Lord, serve Him and do what pleases Him. “My house shall be called a house of prayer for all peoples.” (Isaiah 56:7) This is no small matter to the Jewish exiles who are suspicious of outsiders. It amounts to a seismic shift in their understanding of who God is and what it means to be His people: a tribal deity of old gives way to a universal and all embracing God. We should ask ourselves what it means to apply this expansive vision of God to our social matrix and what it means to be a house for all peoples. Here in Sydney’s West, I am told, asylum seekers and youth radicalization are politically charged issues. As a former boat person, I have a certain kinship to those who are alienated and marginalized. As your bishop, I am committed to be a bridge builder. We must foster pathways across the political and religious divide to build not only a rich and strong Australia but also an inclusive and humane society and a responsible world citizen. Furthermore, Pope Francis urges us to be a Church where everyone can feel welcomed, loved, forgiven and encouraged to live according to the Gospel. There can be no future for the living Church without there being space for those who have been hurt, damaged or alienated, be they abuse victims, survivors, divorcees, gays, lesbians or disaffected members. I am committed to make the Church in Parramatta the house for all peoples, a Church where there is less an experience of exclusion but more an encounter of radical love, inclusiveness and solidarity. “Love one another as I have loved you.” (John 13:34) These words of Jesus can be fully understood not only in terms of his relationship with the disciples but also in the larger context of his engagement with the people. There is that famous song called “I want to know what love is”. The world wants us to show them what Christian love is and we must admit at times what they find does not always match with the words, gestures and actions of Christ. He shows love not only by his passion and death on the cross. He also demonstrates that love through his acceptance, embrace, affirmation, compassion, forgiveness and solidarity, especially towards those stigmatised by others. In doing so he has a habit of challenging ingrained stereotyped attitudes, subverting the tyranny of the majority, breaking social taboos, pushing the boundaries of love and redefining its meaning. It is his radical vision of love, inclusion and human flourishing that ought to guide our pastoral response. We cannot regain our moral credibility without first reclaiming that vision of the humble, powerless, loving Servant-Leader, and making it the cornerstone of all that we do and all that we are as the church. Today with you, the clergy and Catholic people of Parramatta, I am launching out into the deep. With you, I am embarking on a new exodus, walking as pilgrims together, accompanying one another as companions on the journey. “There is no greater love than to lay down one’s life for his friends.” (John 15:13) These words of Jesus challenge us to be the Church that we should be and could be: a house for all peoples, an oasis for the weary and troubled, a field hospital for the wounded, a refuge for the oppressed, a voice for the voiceless and faceless. It is also the invitation our Bishops’ Conference made to our nation at this time: to protect the vulnerable, poor and weak, to treat asylum seekers with justice and dignity, to respect life and to be good stewards of creation. With grateful heart, I ask for your prayer and support as I walk with you in the new exodus to the fullness of life and love. 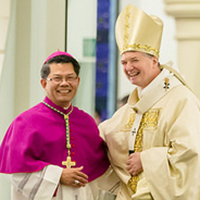 Bishop Vincent Long Van Nguyen delivered this homily during a solemn Mass of Installation on Thursday 16 June 2016 at St Patrick’s Cathedral, Parramatta. To watch the Mass, please visit the video of the live stream. 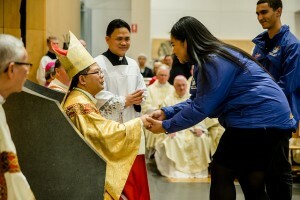 Photos by the Diocese of Parramatta, view the photo gallery.